Winners Cube Deluxe is a double sized redemption arcade game machine made for two players. With its larger, durable and very reliable cabinet built of solid steel that will last like a tank, plus a stylish, modern, clean white mesmerizing look and captivating soundtrack, the new Winners' Cube Deluxe is guaranteed to be an instant hit in any location! The new 2-Player Deluxe model significantly maximizes earning potential that the standard model proved to the industry and it is a centerpiece worthy innovation that is suitable for every arcade or family entertainment center. Winners Cube Deluxe offers two enhanced prize cabinet displays that allow operators to customize for a wider range of prize selections per each side. In addition, two players can simultaneously playfor different prizes of different values, which leads to increased profits! The clean design and construction of Winners' Cube follows a transparent thematic design that portrays a clean, suave and modern look and feel. The luxurious exterior design and brilliant interior lighting makes the Winners' Cube the ultimate attraction in any location. Prizes are displayed through a gigantic transparent display and bright white lights are used to illuminate the prize shelves with a glamorous and sleek attitude. The new 2-Player Deluxe model significantly maximizes earning potential that the standard model proved to the industry and it is a centerpiece worthy innovation that is suitable for every arcade or family entertainment center. 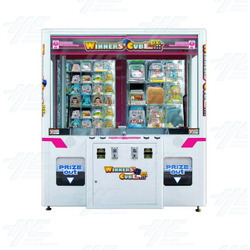 Winners Cube Deluxe offers two enhanced prize cabinet displays that allow operators to customize for a wider range of prize selections per each side. In addition, two players can simultaneously playfor different prizes of different values, which leads to increased profits! The clean design and construction of Winners' Cube follows a transparent thematic design that portrays a clean, suave and modern look and feel. The luxurious exterior design and brilliant interior lighting makes the Winners' Cube the ultimate attraction in any location. Prizes are displayed through a gigantic transparent display and bright white lights are used to illuminate the prize shelves with a glamorous and sleek attitude.